First of all, read the Dedications page… hilarious! “To my mom, and to the child who refuses to go to sleep when it’s bedtime. You in the feet pajamas, that’s right, I’m talking to you. Read this book, then go to bed.” OK, now you have a clear idea how this story is going to amuse and entertain you, and hopefully make that little one sleepy enough to go to bed. Monster and the boy battle bedtime. The boy tries to convince Monster to do the right thing – put the toys away, brush his teeth, put on pj’s – and Monster appears to acquiesce but then he delays bedtime with snacks, books, and TV. Finally the truth comes out that Monster is afraid of the dark. The boy gives him a night-light and a kiss good-night. Monster falls asleep before the boy leaves the room. 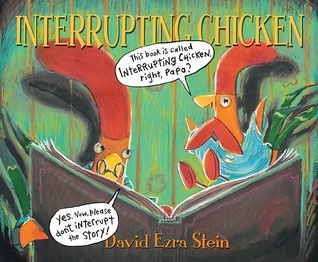 Paul Czajak delivers this wonderful bedtime tale in rhyme and humor. It’s fun to read the story from the boy’s point of view as he has to convince the Monster to go to bed. Preschoolers will see that as empowering. Instead of being the one to be put to bed by a parent, they get to put the Monster to bed. 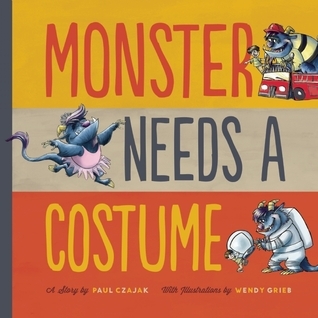 This is the third of Paul Czajak’s Monster books. 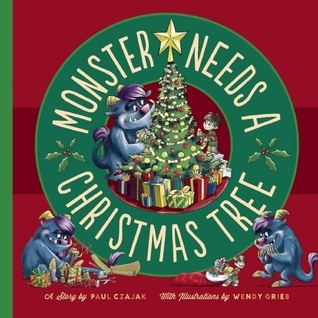 Wendy Grieb has done an amazing job bringing the Monster to life. He is a character you will love to read about again and again. Her details into Monster’s character and the setting are delightful. 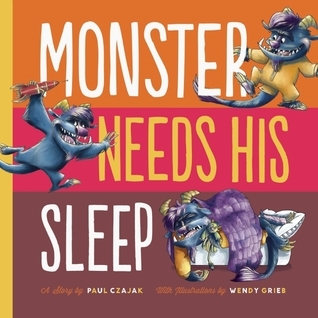 While Monster invokes scary images of ogres or beasts by his name alone, Wendy Grieb helps the reader see that Monster is simply a big, sweet, goof who also happens to be afraid of the dark. When you’ve seen one of the monster books, you’ll definitely want to see them all! I love Monster and the little boy. It is so endearing to see a child face his own fears by way of helping the Monster within to overcome the fear with a simple fix. I can see children identifying with both the boy and the monster, because after all, don’t we all have a little monster within us? This is so much fun to read! If you’ve ever tried to catch a naked toddler you’ll know what I’m talking about. This unnamed character takes off running after a bath, naked, naked, naked! While the child’s poor mother tries to catch him and dry him off, he’s imagining what it would be like to go to school naked, play on the playground naked, or even do the Hokey Pokey naked. He decides that a cape would be an okay concession to being totally and completely naked. Eventually he gets cold and submits to putting on some pants, a top, and even slippers. Exhausted, he finally falls asleep. 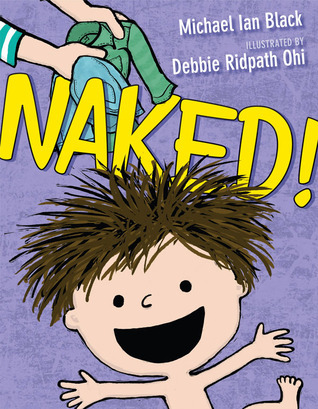 Together, Michael Ian Black and Debbie Ridpath Ohi capture the sheer joy of running naked through the house. The text is simple and to the point; and really, who needs extra words when the whole idea is to be stripped of all encumbering objects. And the illustrations are pure, unadulterated, masterpieces which leave just enough to the imagination. Truthfully, the child in this story could be male or female. I only use the masculine pronoun in the absence of gender confirmation.